The Xbox One was announced by Microsoft at E3 2013 this week. The announcement drew criticism, since many had heard rumors of Microsoft’s newest game console restrictions, such as the fact that the Xbox One would require you to log in once every 24 hours, as well as the fact that the device will remain connected to the Internet, permanently — even if you have no Internet connection. This works when your Internet connectivity is high, but when it’s not? This is the question that many blogs and writers have discussed for some weeks now. What was Microsoft’s response? We here at Tapscape want to examine the words of Don Mattrick, Microsoft’s President of Interactive Entertainment, in his GameTrailers interviewto bloggers and social media members regarding the “Always On” connectivity feature of the Xbox One. There is both good and bad in his remarks, although the negative will probably overshadow the positive. First, though, we treat the positive of Mattrick’s response. Mattrick states in his interview right away that Microsoft has a vision for the Xbox One and the future of gaming (what Mattrick calls “the next decade”). On this front, we must applaud. After all, this is the goal of every great company that innovates. This is the reason why so many writers and consumers attacked Apple in the weeks and months leading up to Monday’s WWDC 2013 announcement regarding iOS 7. What iOS users wanted from Apple is vision for the future. Microsoft may be too ahead of the game with the Xbox One, but at least it’s ahead. People are looking at it, they’re trying to imagine what it will experience, what it will provide, and they haven’t had a chance to use it [Xbox One] yet. So the first thing I’d say to people is, ‘Look, we designed something that’s great. It’s at its core, a games box, and we’ve innovated for what we think are the appropriate scenarios moving forward’. In other words, Microsoft is in charge of Microsoft’s vision. What this means is that Microsoft has the ultimate say-so over the Xbox One. While this is true of any manufacturer, I’m not so sure I would say these words if I was in a situation where customers were complaining about my newest product. After all, the last thing you want to do is turn away customers who have been faithful for the last eight years. It’s a future-proof choice…fortunately we have a product for people who aren’t able to get some form of connectivity; it’s called Xbox 360. 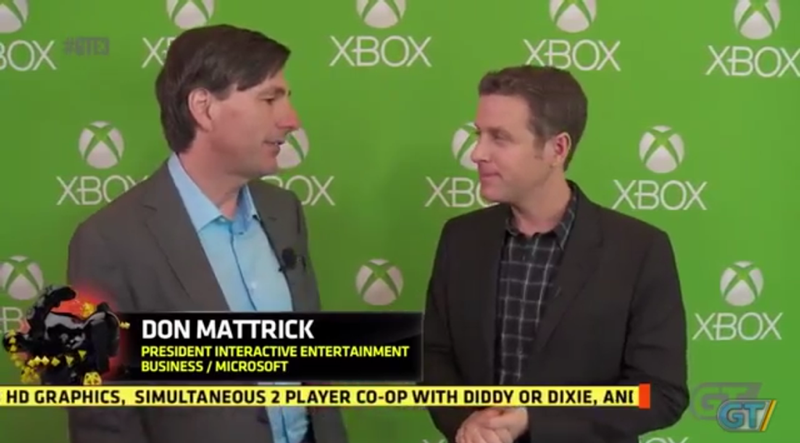 You read it right: Don Mattrick believes that those who have a grievance with constant Internet connectivity should stick with the 8-year-old Xbox 360. For those that want a newer Xbox 360, Microsoft has also released a slimmer version of the Xbox 360 for offline users who live in areas where Internet service is spotty or have constant trouble with their Internet service (or no Internet service at all). Microsoft has decided to keep its Xbox 360 in business for offline users. This is a choice Microsoft has made, but it lacks the very vision of which Mattrick speaks. After all, if a significant portion of your customer base desires to have offline connectivity with the Xbox One, why would you go against what consumers love and do something that will disable a portion of your user base? Microsoft’s decision is based on the market. As Mattrick said in the interview, there was a time when cell phones were only used for calls; now, however, cell phones come with Internet connectivity and can do so many things never dreamed of before. With Xbox One, Microsoft is headed in this direction. Anyone that has kept up with the times knows that the game hardware industry is not doing well. While Apple and Samsung dominate the scene with integrated products, Google and Microsoft are far behind. CNET conducted an iPad survey last Fall and discovered that 40% of iPad users prefer surfing the Web on an iPad and over 30% use their iPad for entertainment, while 27% of iPad users prefer gaming as their first activity of choice on an iPad. In other words, a gaming device such as the Xbox One that lacks Internet and entertainment will not survive in today’s industry. When one couples this with CES 2013 and its “Internet of Things” philosophy, it’s not hard to see that every gadget we’ve ever known can no longer survive without Internet connectivity (it’s why Samsung and LG also showcased Internet-connected washers, dryers, microwaves, and ovens at CES 2013 as well). In short, Microsoft is making a “future-proof” decision (the words of Don Mattrick), but its decision may come back to haunt Redmond in days to come — at least with some former Xbox loyalists anyway.